'Small step for customer service' to discourage long hold wait, bad return policies. 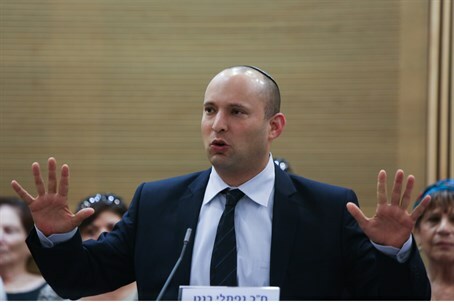 Economics Minister Naftali Bennett (Jewish Home) welcomed a move to impose heavy fines on unfair business practices Thursday, noting the "important step" for Israeli customer service. "Now we will impose a fine of up to 50,000 NIS (roughly $15,000) against a business that treats its customers unfairly," Bennett wrote in a Facebook post. "We have just taken an important small step for the benefit of Israeli consumers." Bennett slammed several bad business practices that affect a minority of businesses in Israel, including a no-return policy, the infamous long wait on customer service hotlines, and misleading sales. While these practices have been discouraged for years, the laws are not enforced, he said. "Harming consumers is a criminal offense," he said. "It sounds good on paper, but the processing of a criminal offense takes a long time, and in many cases the punishment is not very effective. The problem has been that the current law has no 'teeth." "So now we have changed it - harming consumers will result in a fine for the business," he continued. "The benefit to the consumer is that the fine will hurt those who committed an offense, with the additional benefit of the fine being delivered swiftly." "Additionally, we are adding more inspectors and investigators to catch businesses who commit these offenses," he added. "Effective, quick and painful enforcement of the law will protect consumers, and businesses, that are acting fairly."